I find the parallel between the basic geometry of a crochet round and that of a mandala intriguing. A humbler sister of the ritual mandala, the crochet mandala is nevertheless soothing and meditative to make, and pleasing to the eye. 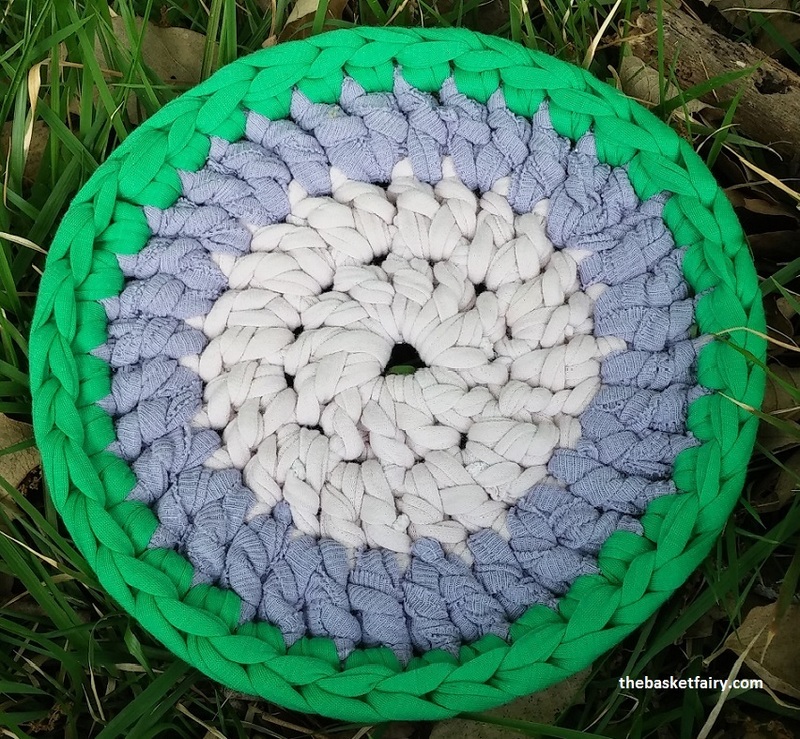 This simple mandala pattern is basic but priceless, because if you’ve got it mastered, you are on your way to making rugs, which are the same thing only bigger, and baskets, which are the same thing but with sides. In the meantime, you can place your hot pan or kettle on it. Scatter a few and you’ll have a gay and festive table setting. The pale pink and purple mandala was made with t-shirt yarn I cut from old shirts. I was able to use a kids’ size t-shirt for the middle, so that’s another nice thing about it – and of course it’s a great project for using up leftover strand bits, which is what I did in the hot-pink and orange mandala. I got the shirts from the ladies at the charity second-hand shop, who opened up their “for discard” shack for me… Such fine, sturdy, pretty cotton fabric salvaged! And t-shirt cotton is so perfect for protecting the table and keeping the pot-base warm. I wrote up the pattern, below, and hope you enjoy making it. One word of advice: Give your mandalas freely to your friends and family, or you’ll end up like me, with a zillion different colored ones in your kitchen drawer! Note: I don’t recommend using this as a pot-holder, because fabric yarn is bulky and the gaps between the stitches can make it unsafe for this purpose. The top mandala is made from recycled t-shirts but for the green rim (I used two old children’s t-shirts). 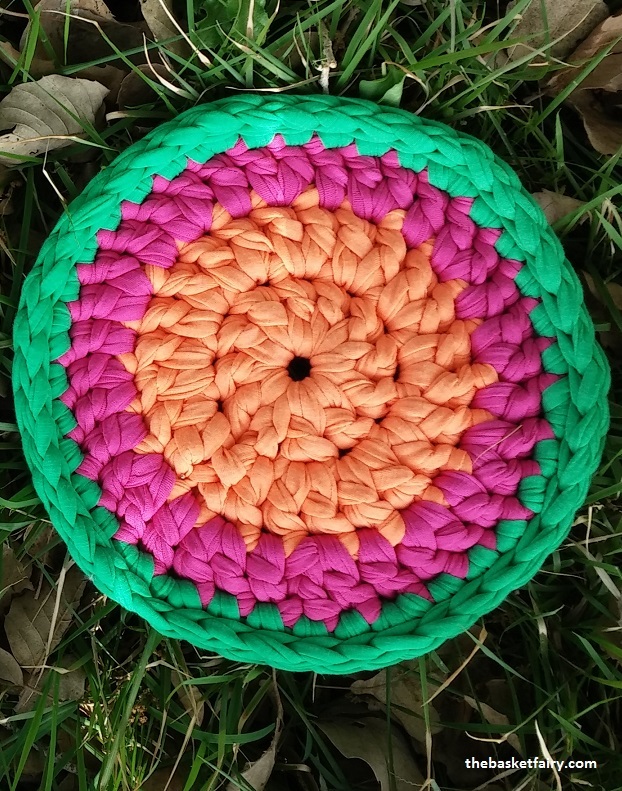 The bottom mandala is made from bought cut strands. I used a size 12 hook, but any size works well as long as it suits your strand. Using 1C, make a magic ring. Row 5: Sl st into each st on previous row (surface slip stitch). Close with an invisible join and cut. (42). The surface slip stitch evens out the rim of the mandala to make it smoother and rounder looking. Row 4: Instead of adding stitches, sc into every stitch, close with an invisible join and cut strand (36). As you are working, draw the hook a bit after every stitch to make the loop longer, before beginning the next stitch. That way, the final row will not turn bowl-like even though you haven’t added any stitches. As you can see in the top mandala, where this technique was used, it gives you a smoother-looking and more circular edging than if you add stitches, but it requires you to draw the loops consistently to make for uniform stitches. With a little practice, it can be mastered, and is worth the effort! For this mandala, I didn’t make a row of surface sl st (Row 5). That’s because when you use the draw-as-you-stitch technique, the last row already comes out even looking. This entry was posted in Projects and tagged crochet, DIY, fabric yarn, free pattern, hot pad, mandalas, recycled, recycling, t-shirt yarn, table setting, tarn, textile yarn, trapillo, trivets, upcycling, Zpagetti, סריגה בטריקו, תחתית לסיר on September 13, 2016 by The Basket Fairy.